Place potatoes directly onto oven rack. Bake for 50 minutes or until cooked through. Heat your Black Knight Barbecue. Sprinkle lemon pepper over fish. Spray lightly with oil. Barbecue fish for 3 to 4 minutes each side, turning carefully with a spatula, or until just cooked through. Spray rolls lightly with oil. Chargrill, cut-side down, for 1 minute. Divide lettuce between roll bases. Top with fish, cucumber, carrot, tartare sauce and bread roll tops. Cut a cross in top of each potato. Squeeze bases gently to open. Combine yoghurt and chives. Spoon onto potatoes. 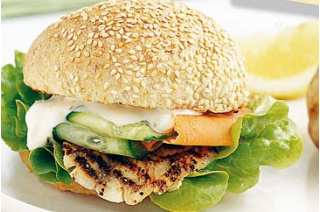 Serve with fish burgers and lemon wedges.